I had planned to publish this post yesterday, but unfortunately due to a mini-crisis, I was unable to. The mini-crisis was that when I tried to turn my mobile phone on yesterday, it wouldn't turn on. I tried everything and it just wouldn't turn on! I was in such a panic and worried I had lost all of my contacts, photos and downloads. I ended up having to buy a new phone. I was lucky enough to be able to restore my contacts and photos, but haven't yet been able to restore my previous texts, downloads and some other things. 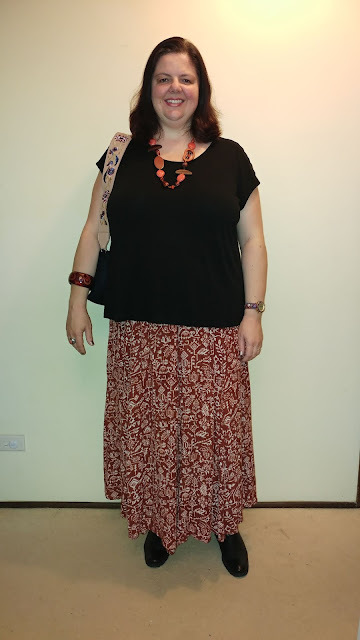 In this post I thought I would show you three of the outfits I wore in the past week. The weather has been quite unpredictable with everything from cool to hot temps and a massive thunderstorm! In spite of the erratic weather, I do love this time of year. The flowers are in full bloom and the humidity is bearable, unlike in summer! I hadn't worn this necklace for ages! I bought it all the way back in 2001. It was so fun to wear this necklace again and it brought back a lot of happy memories from my past adventures! It's amazing how just the addition of a new accessory can inspire new ideas for putting an outfit together, isn't it? Earlier this week I bought this hot pink beaded necklace. It's vibrancy and chunky style instantly appealed to me and I noticed it amongst a sea of necklaces, immediately! My first thought was that it would look great against a sky blue background, so choosing the top was easy. I then remembered my fun tie dye shoes and new they would complement the colours perfectly. I was going to pair the top with jeans, but then I remembered these floral print pants. I've worn them a lot lately, as I love the colours and print and they are so comfortable and durable to wear. Then the final touches were made: a few more hot pink accessories and my (almost) vintage tie dye bag! I seem to be gravitating towards autumnal colours recently, even though it is spring here in Australia! Red, yellow, purple, orange and now brown! I haven't worn this skirt in ages, but I do really like its quirky print. The umber/sienna colour acts as like a cave wall background, with the white drawings and shapes looking like ancient paintings. I never used to wear orange or brown or any variations of either colour and now I really like both! I like the brightness of orange and the earthiness of brown. In fact, these days there really isn't a colour I wouldn't wear! 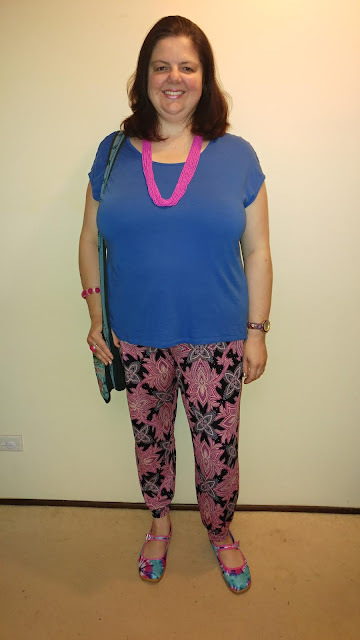 Since I started blogging last year and following other blogs, I have developed an appreciation of wearing different colours, styles and prints. It really is so inspiring seeing how other non-famous, non-celebrity people dress! I am much more inspired by women of all different ages, sizes and shapes showing off their personal style, than any celebrity! Thanks for the inspiration! This was the first wear of my newly thrifted skirt, bought last weekend. It was such a great find and was only $6! I really love the mix of colours and the stripe/chevron print. 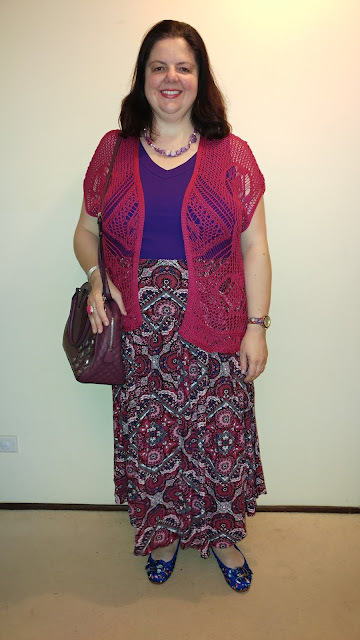 I decided to pair it with my newly thrifted colourful necklace against a plain top and added a blue cardi. 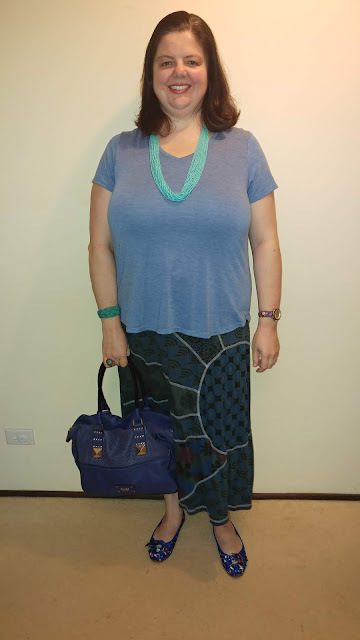 I also chose my bag with the colourful tassels and strap to complement the pattern in the skirt. 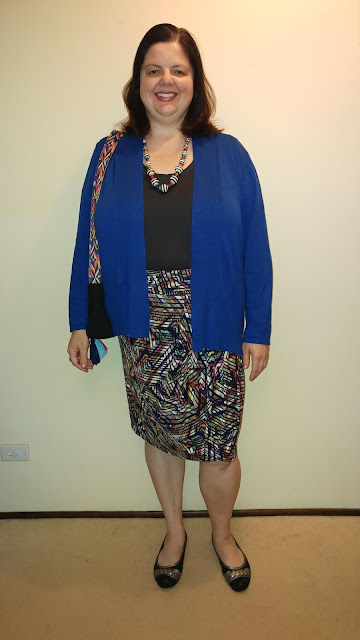 The skirt was comfortable and there are so many colour combinations possible with this skirt, so it is definitely versatile! I will definitely be checking out more op-shops again soon! Speaking of, I just remembered there is another thrifted skirt I haven't shown you yet! I'll have to wear it soon! Now that the weather is finally starting to warm up, I've been making an effort to wear some of my favourite skirts that have been hidden away for a few months. I bought this gorgeous skirt at a quirky and cool shop in Osaka, Japan. The shop had a mix of new and pre-loved clothing and accessories. This skirt was a one-of with no tags, so I'm assuming it was pre-loved! It is such a beautiful skirt in great condition and is fully lined. I love the style and colours of this skirt and it's folk print. It's also very comfortable to wear and doesn't crease after wearing it all day, which is another bonus! 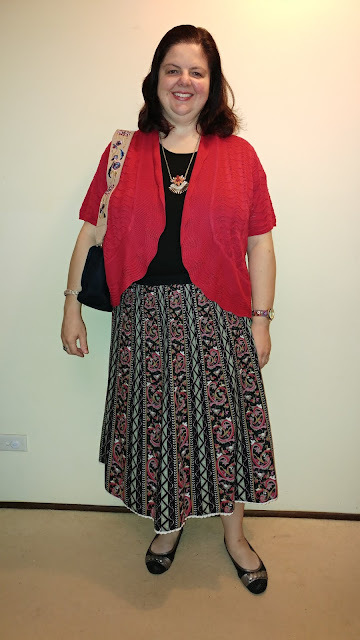 In this outfit I decided to go with a black top as a base and added a red cardi to complete the look. I knew that my recently purchased bag with the embroidered strap would complement the boho/folksy print of the skirt. I love this bag! It was a great buy, which is even better!